The high-security registration plates will be compulsory for all vehicles manufactured from today. RTOs in Mumbai region will have to ensure that brand new cars are fitted with the fool-proof plates with chromium-based holograms. A circular with directives on implementation of the new plates has been issued to all 50 RTOs in the state. 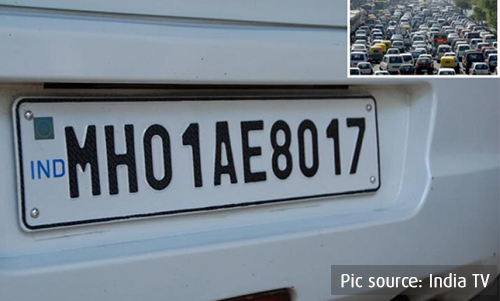 For existing vehicles, old number plates have to be replaced with the new ones. However, this might take some months to begin in the state as the tendering process to appoint a vendor is not yet complete. As the process is kept on hold due to the poll code of conduct. Once numbers are embossed on new plates, they will have to go through scrutiny of RTO inspectors who will stamp approval before dispatching RC (registration certificate) book. The move has been initiated by the Centre to curb vehicle theft and ensure that uniformity of number plates. HSRP will also ensure that you do not tamper with the number plate or change the font type or size. This will eliminate the problem of vehicle owners distorting fonts on number plates to display names, letters in Devnagri script and other fonts. The vehicle dealers will also have to update the security codes of each plate on the Vahan portal so that the same can be accessed by enforcement agencies across the country by merely scanning the number plate. The high-security number plate will be made of a rare aluminium alloy and it will contain a retro-reflective hologram, hot-stamped lettering, a 10-digit unique serial number, and will be fitted with a snap lock, which is expected to make the plate tamper-proof.